The true test of the value and importance of anything- a book, a piece of music, a work of art, even a person- is time. 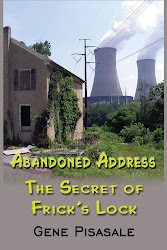 Often it takes years, sometimes decades to discern the many nuances of actions not apparent at first glance and this period of reflection is necessary to understand those things "unseen" originally, or hidden by the interplay of personalities and tumult of the times in which they were experienced. It is almost a certainty that the actions of statesmen and Presidents will be viewed somewhat differently 20... 50... 100 years after they leave office. If only due to the benefit of a longer term perspective- and the often lengthy gap between initial action and long term consequences- historians and biographers take a "second look" at the actions of Presidents and the secular repercussions of those actions. This is why Presidents like Harry Truman and Dwight Eisenhower- both rated somewhat poorly immediately after they left the Oval Office- are now typically rated much more favorably, often in the top ten of all Chief Executives. It is with this same perspective that this historian now takes a fresh look at President Ulysses S. Grant. 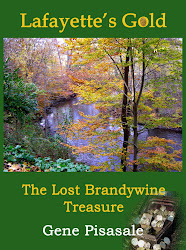 Hiram Walker Grant (1822- 1885) had a "colorful" life. After serving with distinction in the Mexican-American War- a conflict he personally opposed- he began drinking heavily and resigned from the Army in 1854. 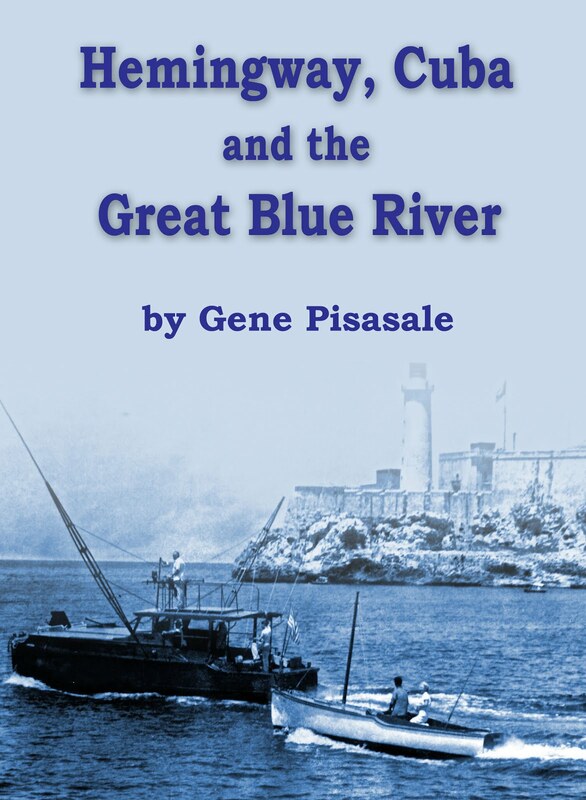 Grant struggled through a few different jobs, but by the outset of the Civil War in 1861 was ready to get back into action and was reappointed as a Colonel of the 21st Illinois infantry. 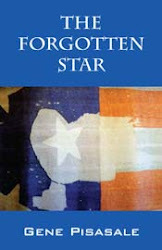 It was during the Civil War that Grant's star began to rise. Showing a fearless attitude pursuing Confederate forces in battle, he became Lincoln's favorite officer. Lincoln recognized Grant's fighting abilities and promoted him because of his many successes on the battlefield, during a period when several other Generals failed to achieve measurable success. Presiding over the crucial victory at Vicksburg and later accepting the surrender of Confederate General Robert E. Lee, Grant was lauded as the greatest hero of the Civil War. By 1868, following Andrew Johnson's term, Grant was encouraged as a war hero to run for the Presidency and was selected unanimously for the nomination of the Republican Party. Grant served two terms as President, during a period filled with great uncertainty over the direction of the nation and his own personal struggles with scandals- five in total- that rocked his Administration, even though he was largely disconnected from the events. Historians have rated his team- and their associates- as some of the most corrupt to ever hold public office. 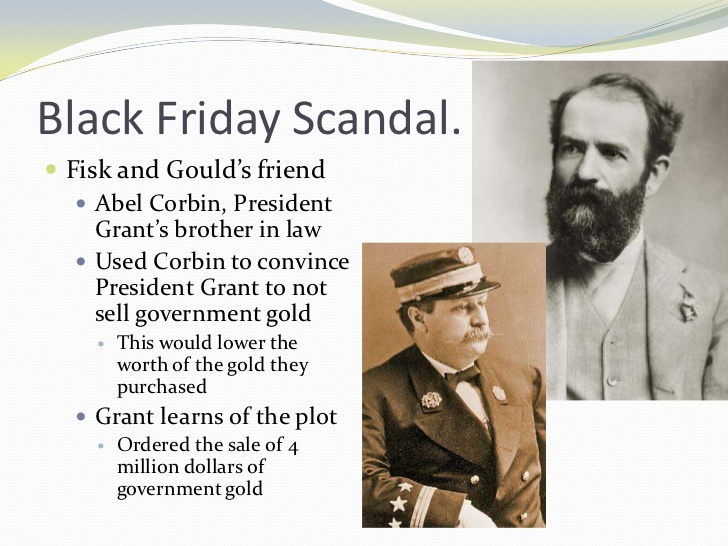 Grant's first Vice President Schuyler Colfax was accused of accepting deeply discounted shares of stock in the Credit Mobilier company which helped in the construction of the Transcontinental Railroad. Shortly after Grant took office, James Fisk and Jay Gould attempted to corner the market in gold with help from Grant's brother-in-law, causing the Panic of 1869. Grant's Treasury Secretary William Richardson was forced to resign over a kickback scandal related to tax collections. 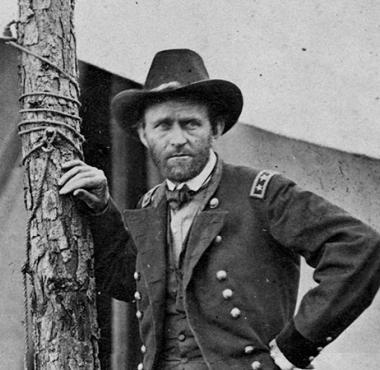 From the start to the end of his two terms, it seems that scandal followed Grant wherever he went, even though he was personally viewed as an honest man. 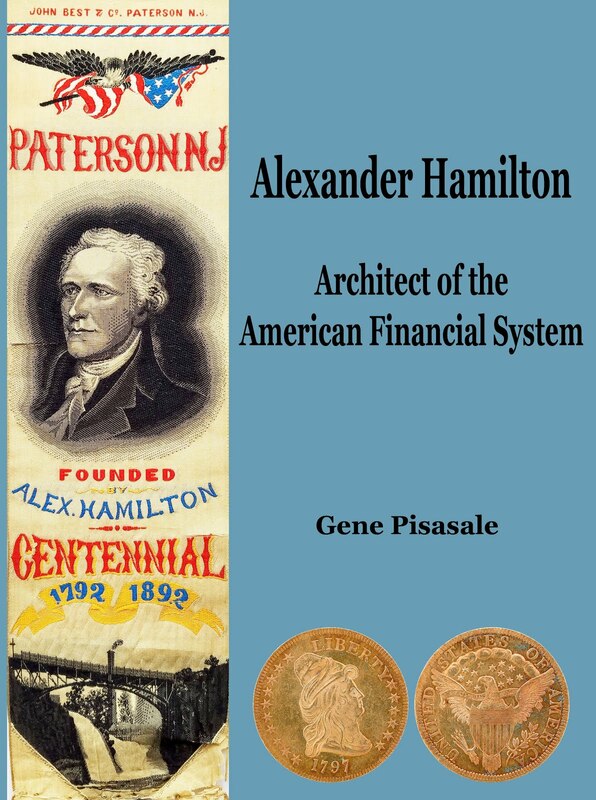 The financial Panic of 1873- one of the worst in American history- did nothing to help his reputation and deepened people's suspicions concerning his effectiveness and success as President. After he left office in 1877, his reputation tarnished due almost exclusively to the corrupt practices of others, Grant did not have long to live. He went on a global tour around Europe, Africa and Asia which allowed him to meet Queen Victoria and Pope leo XIII. He also dabbled in politics, nearly gaining the nomination of his party in the election of 1880. In 1884- only seven years after leaving the Oval Office- he started experiencing sharp pains in his throat. 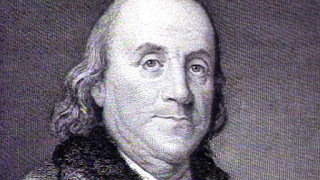 Being a lifelong cigar smoker and heavy drinker, his personal habits may have played a role in his health deteriorating. Grant was later diagnosed with throat cancer. He went downhill quickly over the next year, losing his voice and dropping in weight by more than 60 pounds. He wanted to write his memoirs to allow his wife and family to survive with the royalties- but did not have much longer on this Earth. Determined to write an accurate account of his life, including detailed descriptions of critical Civil War battles, Grant began working on his memoirs after being offered a $25,000 advance by Mark Twain. 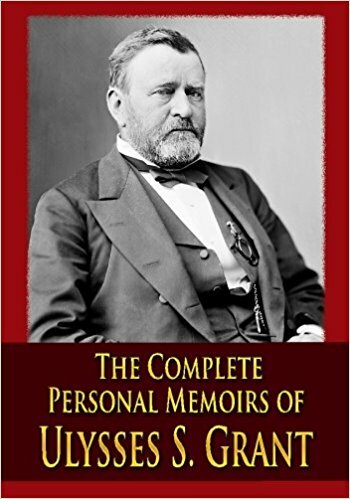 Grant worked tirelessly over the following months to tell his life story in bold, unadulterated prose, a work that has been recognized as one of the greatest by a American President. 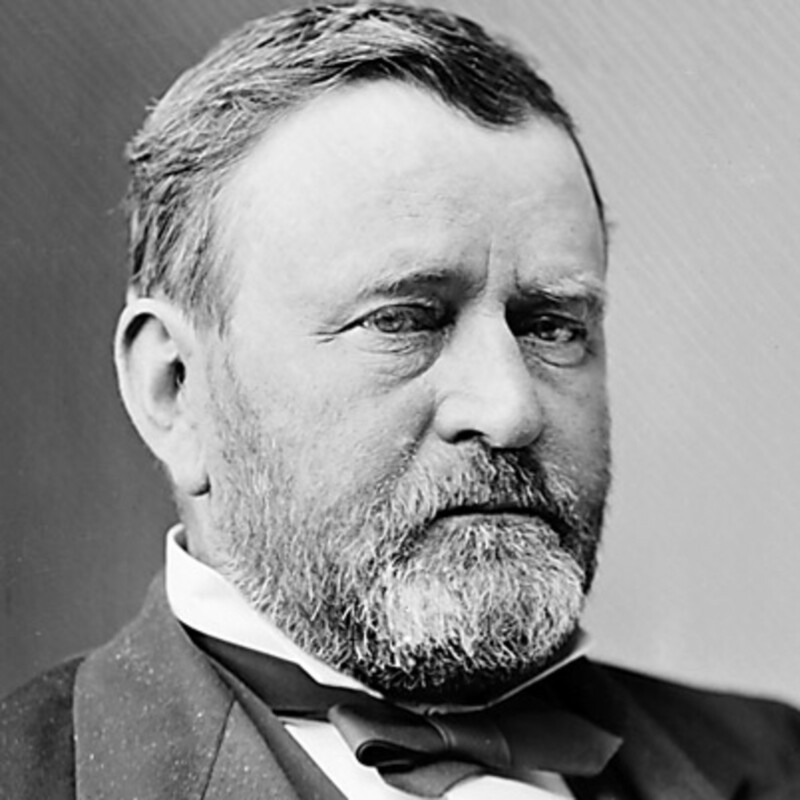 In a 1962 historian's poll, Grant ranked near "the bottom of his class"- 30th out of 31 Presidents. As often happens over time, perceptions of Presidential accomplishment changed- and Grant is no exception. A 2018 poll ranked Grant 21st out of 45 Presidents- the "upper half" of his peer group- quite an improvement over the five decades. What changed? Recognition of Grant's honest and admirable character, as well as evaluation of his accomplishments during the difficult period of Reconstruction, including passage of the 15th Amendment to the U.S. Constitution, among many other things. Grant sharply opposed people who tried to intimidate blacks against voting- notably the Ku Klux Klan- and as President authorized mass arrests of persons participating in aggressive, terrorist actions against Negroes. He created what is now known as the National Park System, with the first one- Yellowstone in 1872, so he can be considered America's first conservationist President. Grant also signed the Specie Act of 1875 supporting "hard money"- a move designed to allow the U.S. Treasury to accumulate sufficient gold reserves to accommodate any requests for conversion of paper currency into coin, a move which strengthened public confidence in the U.S. Treasury and America's currency. Grant also appointed four Justices to the U.S. Supreme Court, some of whom wrote precedent-setting opinions and served with distinction. 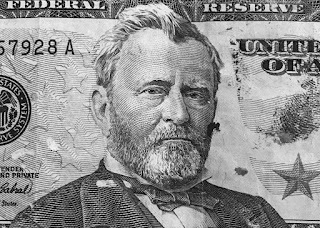 Overall, despite the public perception of his links to scandal, Ulysses S. Grant is now viewed much more favorably by scholars and historians. Ron Chernow's book Grant (2017) takes a fresh look at the 18th president, granting him a much better- and fairer- review than many of those written in previous decades. Time changes everything. To his credit, Grant's reputation has improved markedly in recent years. Due to his extensive service to our nation during a very challenging period of our history, Ulysses S. Grant deserves a "second look"- and at least a "Thank you" from all Americans. Is America Still 'The Last Best Hope of Earth'?" 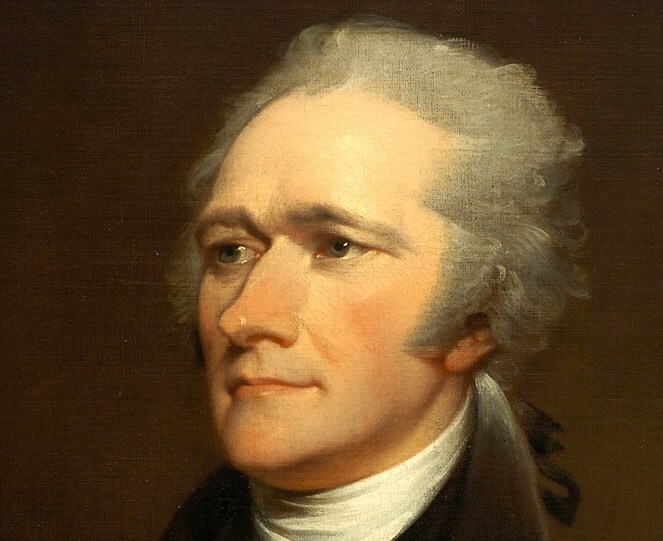 In his excellent book America- The Last Best Hope, former Secretary of Education William Bennett revisits a quote from President Abraham Lincoln who said these words in a letter to the United States Congress two months after he issued the Emancipation Proclamation: "We shall nobly save or meanly lose this last best hope of earth." 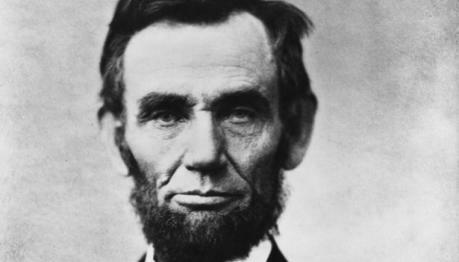 Lincoln was talking about the possibility that the Union could be destroyed or irreparably harmed if the Confederacy succeeded in fracturing the nation. That nation- born of noble ideas and dedicated to pursuing liberty and freedom- could easily have faltered if the South prevailed. 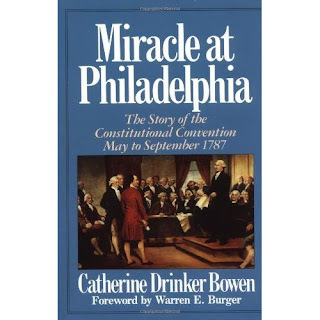 If that had happened, the painstaking work of the Founding Fathers would have been merely a footnote in a much darker narrative where the forces of evil prevailed, our country was wounded and mankind became all the worse for it. In a speech he planned to give on that fateful day in Dallas in November 1963, President John F. Kennedy said "We in this country are the watchmen on the walls of world freedom." More than 50 years have passed since then and both citizens and politicians have widely varying viewpoints on whether the U.S. should be involved in engagements around the globe. Yet his words remain true today. No other country commits the resources, the manpower or the effort necessary to combat brutal dictators, rogue regimes and now- terrorists- abundant on the global stage. What kind of world would we have today if brave American soldiers had not fought in World War I or World War II? How safe would the Middle East and the rest of the world be today if the U.S. had not defeated Saddam Hussein in the Gulf War and later, taken action against the terrorists who struck on September 11, 2001? 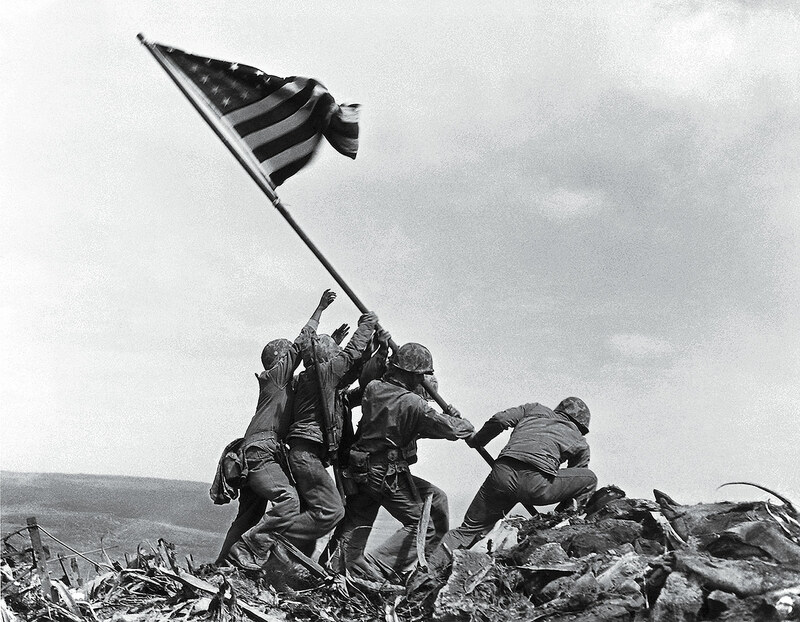 For more than a century, America has "stepped up to the plate" and aided nations in need, thwarting brutal governments and other elements who tried to destroy essential freedoms enjoyed by hundreds of millions of people. Fast forward to the year 2018. America still has troops on the ground in Iraq, Afghanistan, South Korea and other hot spots around the globe. Why? There are two reasons: 1) they remain highly unstable areas, threatened by violence and terrorism and 2) no other country is likely to commit the resources necessary to achieve stability in these regions. The phrase "The U.S. should not be the world's policeman" generates a lot of discussion- for good reason. Peace and stability should be goals shared by all nations, yet the level of commitment to those goals varies dramatically from country to country. America has been blessed to partner with strong allies like England, France and other nations in various conflicts over the years, but it appears to some people that we always shoulder the greatest burden. Why should the U.S. perennially be the leader in fighting wars and promoting stability in countries thousands of miles away? The answer is quite simple: without our efforts, the world would be a far more dangerous place. Lincoln was right. His words ring true today, more than 150 years after he wrote them. 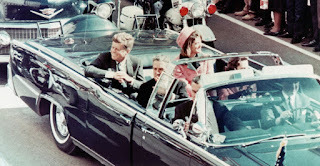 Kennedy's planned remarks are just as vital in the year 2018 as they were that day in Dallas. America IS the world's greatest superpower- and with that comes many responsibilities. If America falters, the world becomes a much darker, more unstable place, susceptible to tyrants and rogue regimes. The United States remains- and hopefully always will be- the last best hope of Earth. Do Americans Understand How Our Government Works? If you've ever seen an episode of Watters' World on television, where Jesse Watters goes out on the street asking people questions about America, our government and our history, you know that many Americans are, shall we say... challenged in their understanding of those topics. 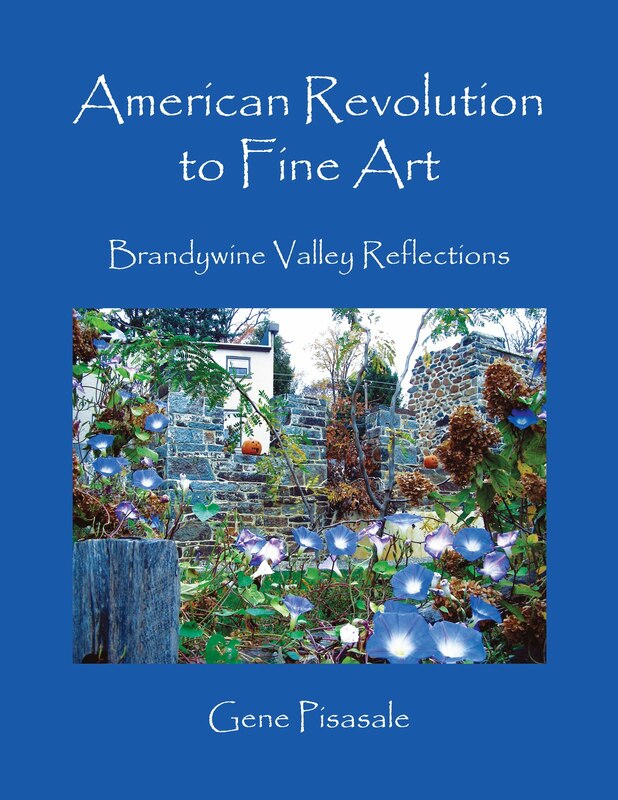 Some people interviewed could not say which occurred first- the Civil War or the Revolutionary War. Some blacks interviewed surprisingly could not name the U.S.President who freed the slaves. It is thus not a revelation that many Americans do not know- or have little understanding of how our government works. The Founding Fathers were an enlightened crew. They understood that a republic needed a mechanism by which it could allow itself to function while respecting the inherent rights of mankind. They also knew that the government would need to enact laws which guided the actions of its citizens. 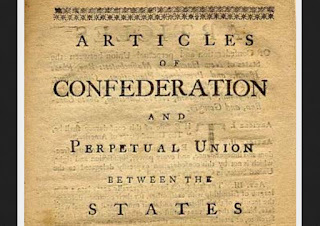 When delegates to the Constitutional Convention met in Philadelphia from May through September 1787, they already had a basic framework to utilize: the British Parliamentary system. Most among the group were highly skeptical of too much power or authority residing in one person or group, so they created a tripartite structure to avoid many of the pitfalls of other governmental systems around the world, notably the British system with its all-powerful King. James Madison was one of several highly intelligent delegates to the Convention. His plan for the three branches of government- the Legislative, the Executive and the Judicial Branches- allowed for "checks and balances" necessary to sustain a fledgling democracy. Many people today think that America is a pure "democracy". That is not accurate. We are a representative republic, whose citizens do not give an "up or down" vote on every issue or law, but vote for representatives who will decide those matters. Citizens concede that authority to their elected representatives and if they don't approve of their actions, citizens get the chance to vote them out of office. While some people may like the idea of having the power to make those decisions every day for themselves, such a system realistically could not function, as it would collapse under its own weight, ending in chaos. The Legislative Branch consists of the U.S. House of Representatives, whose members serve two year terms and the Senate, whose members serve six year terms. The House and the Senate make the laws of the land. The House was patterned after the British House of Commons, which has a direct tie to its citizens through regular elections. The Senate was patterned after the British House of Lords. The House holds "the purse strings", as all appropriations for expenditures and debt must be approved by its members. 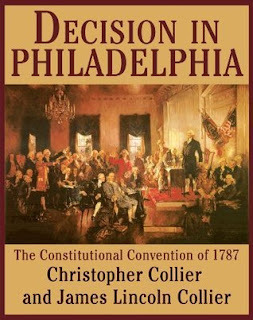 The Founding Fathers intentionally gave the House this authority because they wanted citizens to have regular input into how the country was being run. This structure allows citizens to vote every two years for those representatives who will be most prudent in their actions and spend taxpayer funds most wisely. 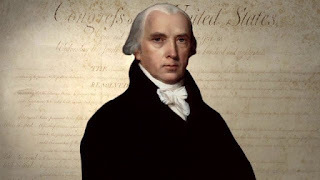 James Madison, considered by many as the "Father of the Constitution"
The Executive Branch is represented by the President. He executes the laws passed by Congress, acts as Commander-in-Chief of the military and the representative of our nation on the world stage. The President holds many powers which he can use by Executive authority, including the right to make treaties (approved by Congress), appoint Cabinet officers who will oversee various areas of government and the economy and also deal with foreign powers. 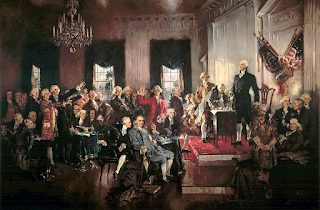 The Founders specifically wanted to limit the authority of the Chief Executive because they were well aware that an overbearing King could act as a tyrant, taking away many of what they considered to be God-given rights. 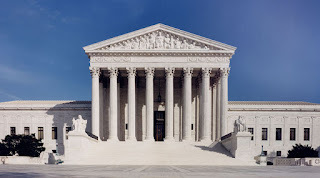 The Judicial Branch consists of the Supreme Court, the District and Appellate Courts and others both in the Federal government and throughout all the states. 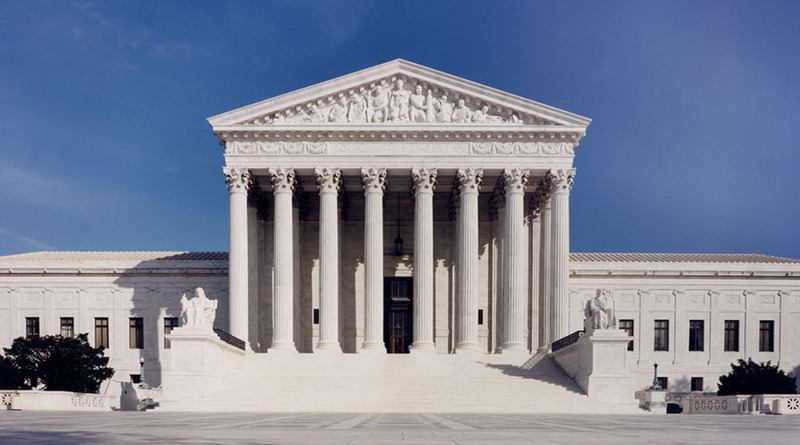 The Judicial Branch decides what laws and actions are in accordance with the Constitution. It has the authority to decide what is, in effect "legal" or not. As anyone who's been involved in a lawsuit knows, the legal system in America can be a confusing and frustrating place. What might seem reasonable and fair to the average person can actually be illegal or disallowed under our system of justice. Example: many people believe all representatives should be under term limits, so as to prevent them from being in positions of authority for too long. Yet term limits were actually declared unconstitutional by the Supreme Court a while back. If you want term limits, you'll have to work for a Constitutional Amendment which puts them in place someday. The United States Supreme Court Building, Washington, D.C.
Winston Churchill once said "Democracy is the worst form of government... except for all the rest." The Founding Fathers knew that those in positions of authority- like Kings- could sometimes abuse that power and take actions harmful to citizens and to the functioning of society. Alexander Hamilton stated it clearly: "Give all the power to the many, they will oppress the few. Give all the power to a few, they will oppress the many." Despite its flaws, the American system of government remains the best and most effective system devised by man. It is envied by hundreds of millions of people around the world who live under despotic regimes and brutal dictatorships. The Founders understood that over time, changes to the system would become necessary. That is why they allowed for Amendments to the Constitution. The first ten of those Amendments became what is now referred to as the Bill of Rights. 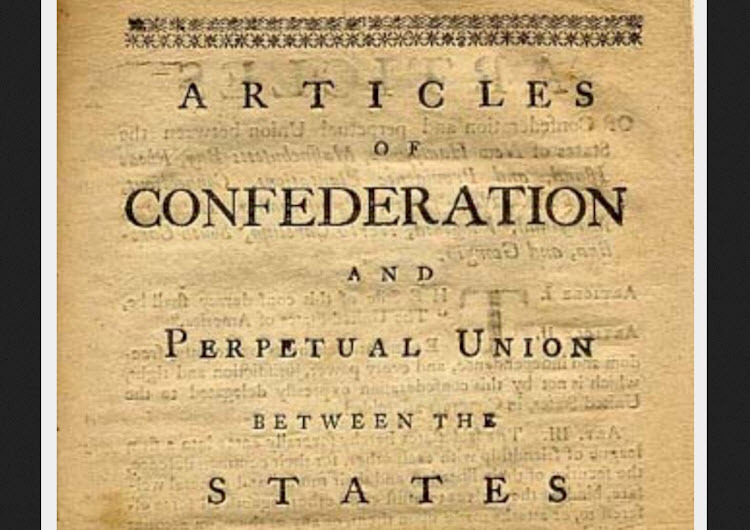 Thomas Jefferson maintained that a republic could not survive unless its citizens were educated, well informed on the topics of the day and made their voices heard. So, if you don't like the way our government works, contact your Senators and your Congressman. Write to the President and tell him how you feel. You'll be making your voice heard... and actively participating in this grand experiment we call America.